Raiders hold Mustangs to six points in first half. 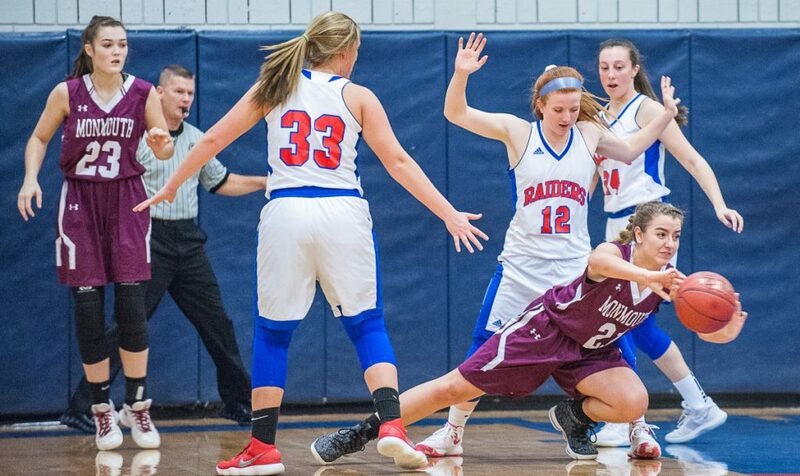 WALES — Oak Hill spent a quarter subduing its first-game jitters, then subdued Monmouth Academy to the tune of six second-half points to pull away with a 43-21 win in both teams’ Mountain Valley Conference girls basketball opener Saturday. 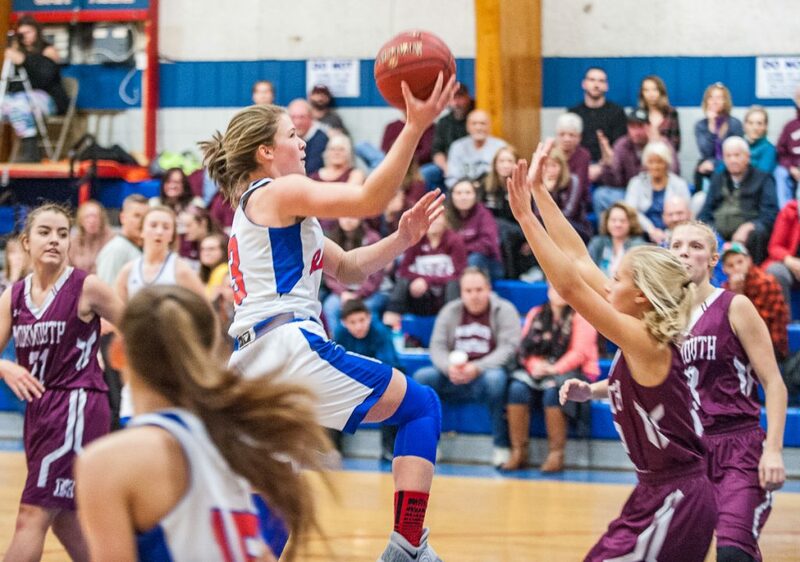 Abby Nadeau scored a game-high 15 points and Desirae Dumais scored nine of her 12 points in the game-changing second quarter for the Raiders. Kaeti Butterfield led Monmouth with five points while being plagued with foul trouble. After emerging from a see-saw first quarter with an 11-10 lead, Oak Hill held Monmouth without a field goal for roughly half of the game to take command in the second and third quarters, where they outscored the Mustangs, 26-5. Butterfield gave the Mustangs a 14-13 lead with a hoop early in the second quarter. They wouldn’t make another field goal until Katie Harris’ layup with 6:25 remaining in the game. 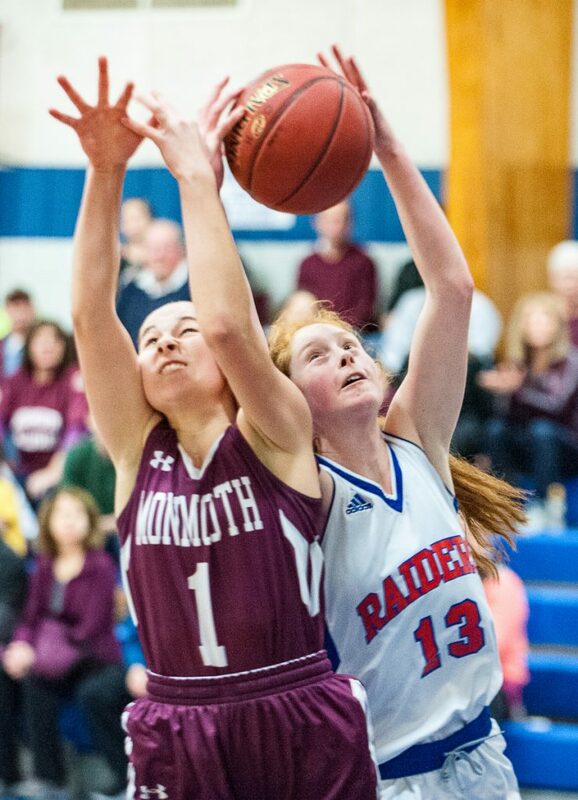 The two-time defending Class C state champions, Monmouth was playing its first regular season game under new head coach Rick Larrabee, who was appointed prior to the start of preseason when coach Scott Wing was fired for reasons Monmouth administrators have not disclosed. The Mustangs also graduated three starters and lost another, senior forward Destiny Clough, to injury. Dumais put the Raiders in front for good with a three-point play to make it 16-14 and kick off a 15-1 run to end the half. Nadeau’s three-pointer gave them a double-digit lead, 25-14, with 1:37 left in the half. An Abby Ferland free throw broke up the Raiders’ run, which ended with a 28-15 lead at halftime. Neither team could find the range to start the second half until Audrey Dillman broke the ice for Oak Hill with a baseline drive midway through the third quarter. The Mustangs missed all 11 of their shots in the period and trailed, 37-15, at the end of it.